Whilst Sri Lanka at the macro end is grappling to pay the $ 15 billion debt in the next four years, private sector and civil society is pressuring the Government to bring in structured reforms and stronger governance to curb the alleged corruption that is being reported in the weekend media. At the macro end this rhetoric is being debated while at the household end we see that a Sri Lanka housewife is being challenged further whilst adding pressure to the purse. This is making the Government in power not very popular. Let me do a deep dive on this. As per the last week’s Central Bank Economic Report, the Colombo Consumer Price Index increased to 6.8% from 5.5% in January 2017 vs. last year which means that the cost of the basket of food is increasing. Annual average inflation increased to 4.6% in February 2017 from 4.3% registered in 2017, which further explains the price increases that a typical Sri Lankan housewife is experiencing at home, adding pressure to the purse at home. The CCPI core inflation that reflects the underlying inflation in the economy increased 7.1% in February 2017 from 7% in January which means it’s on an upward trend which is worrying. 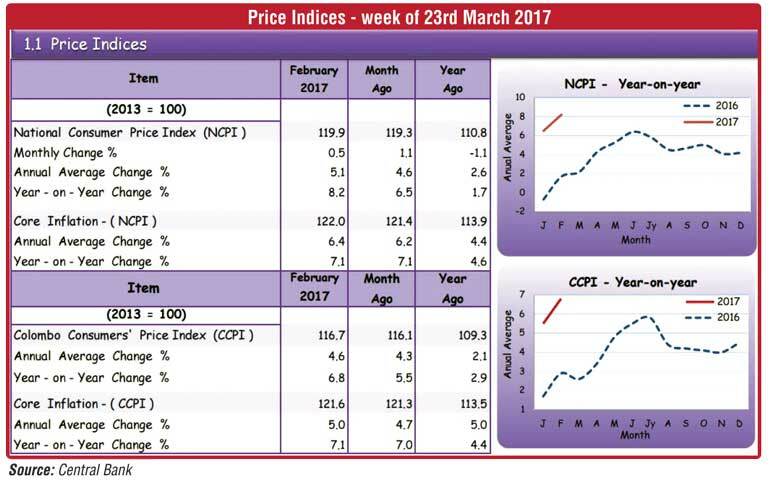 The annual average CCPI core inflation increased to 5% in February 2017 from 4.7% in January which reflects the heart of the problem in a typical household of Sri Lanka. The National Consumer Price Index (NCPI) moved up to 119.9 from 119.3 a month ago and 110.8 a year ago, which brings us closer to the issue from a practical layman point of view. Samba rice increased to Rs. 87/50 from Rs. 85 per kg last week whilst red kekulu rice is at Rs. 75, beans Rs. 110, red onions Rs. 90, dried chillies Rs. 175 per kg, dhal at Rs. 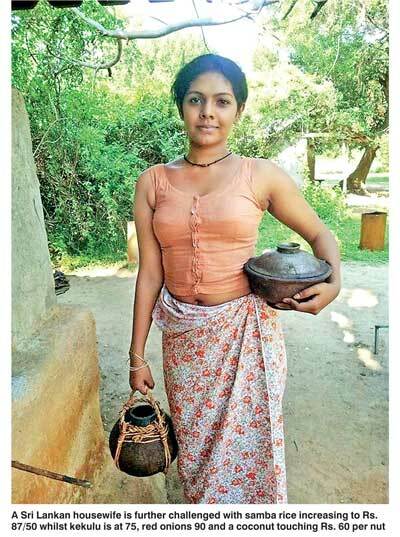 175, and a coconut at Rs. 60 per nut. This is the reason why 43% of the households are stating that they do not have any spare cash at home as per the latest AC Nielsen update, which explains the logic. I guess this is the reason for the agitation that we see in the general public and media at large. If we analyse the macro trends that led to the above situation, the reality is that credit to private sector has risen at an annual rate of 22% whilst the Central Bank’s lending to the Government has skyrocketed, recording an annual growth rate of 80% per annum. Investments in Government securities by foreigners have fallen from a peak of $ 3.5 billion in February 2015 to $ 1.2 billion as at the end of February. The freely available foreign reserves have fallen to a record low level of $ 4.7 billion as at the end of February, whereas the country’s debt repayment obligations during the next 12-month period have increased to $ 4.8 billion. The obvious corollary has been to exert pressure for the exchange rate to depreciate which has resulted in food prices increasing. As at now rice, sugar, dhal, pulses, potatoes, sprats and for that matter even chilies are all imported. In this background Sri Lanka cannot remain silent to the US monetary policy tightening. If Sri Lanka does not follow the global trend, the remaining foreign investments in Government securities by foreigners amounting to $ 1.2 billion might also fly out of the country. That would be fatal to Sri Lanka’s exchange rate and hence we have no option but to increase the policy rates, which is what currently is in progress. But then we must face the next challenge, that it will have an impact on the growth of the country. The logic being to tighten monetary policy by way of an increase in Central Bank’s policy interest rates leads to the overall cost of capital increasing and hence project viability being questioned. If we take one of the burning issues of the country, it is lagging export revenue. Sri Lanka exports proceeds have registered a -2.3% performance vs. last year as at end November 2016 as per the latest statistics released by the Central Bank last week. Latest data from the Harvard Development Centre reveal that in the last 15 years in Sri Lanka (2000-2016), seven new product categories have generated only $ 0.1 billion dollars, which is a very low export innovation performance of a country under any circumstances. This needs to be addressed given that when a country’s cost of capital is high, initiatives such the above that involve considerable capital infusion become financially unviable, which in turn impacts the overall competitiveness of Sri Lanka and in these case exports. Hence, we see the spiral between macro issues and the link to private sector strategies which now is emerging. The planned new tax structure that has been speculated in the weekend media will further add pressure to managing organisations and specially investments into new product development initiatives that is a national priority. A point that needs attention is that more aggressive countries in the global market place like Thailand have launched as much as 70 new products generating $21.6 billion dollars into the country whilst top notch countries like China have launched 76 new products generating a straddling $ 331.6 billion dollars which explains the ramifications when one tightens the belt by increasing policy rates. Whilst the macro situation must be corrected for stability, may be strategic development will have to be done with a concessionary funding on specific areas. A case in point is the new product development initiatives in the export sector. May be just like the concessions offered in the last three budgets on any investments done on research, they must be extended to national issues such as the one discussed above on product development.